This movie doesn’t start out too promisingly, with a claustrophobic, ho-hum fight between two guys in a boxcar (oh boy, a fight in a boxcar!). Then, during the credits, a shot of the passing train actually includes a moment where the camera wobbles quite badly. “Oh God,” I thought, “what kind of low-budget boredom am I in for?” As it turns out, the movie gathers itself like a train gathering speed, becoming more splashy, ridiculous, and rollicking as it goes along. And it is perhaps not too low-budget, either–it may not be Bond, but the sets are suitably exotic and eye-catching, with a rich, velvety decadence permeating the proceedings. Robert Stack is amusingly noxious as a freelance photographer who tries to kiss every woman who is trying to steal from him or kill him. Within seconds of meeting her. In fact, if you’re a woman, he’s probably trying to kiss you. 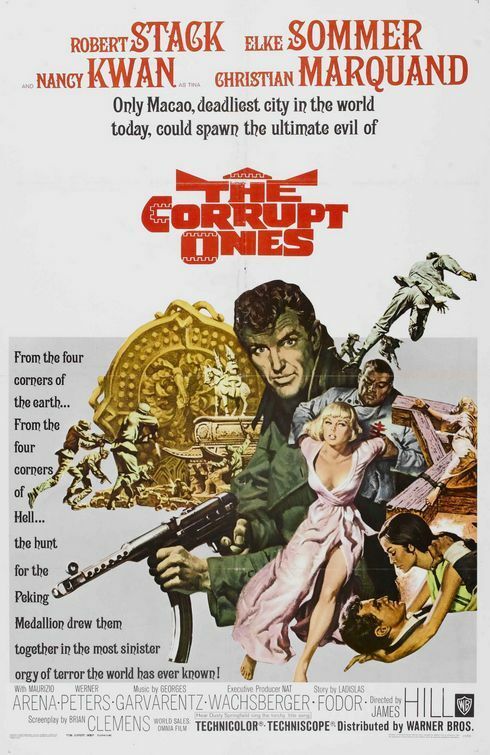 That would include Elke Sommer, of course, but even more notable is Nancy Kwan, who steals the movie along with her bad guy enemy/ cohort Christian Marquand (he’s the plantation owner in Apocalypse Now Redux). The plot is ridiculous, the finer points are ridiculous, and the movie would not be half as entertaining were it not so. For a movie largely known for the title track, sung by Dusty Springfield, a lot more fun than I expected.